more of a 'i can't quite believe i did it' way. it is a little bit Tif. she is filled with high hopes of things to come. I so love the ribbon design on this dress - well done it is gorgeous! 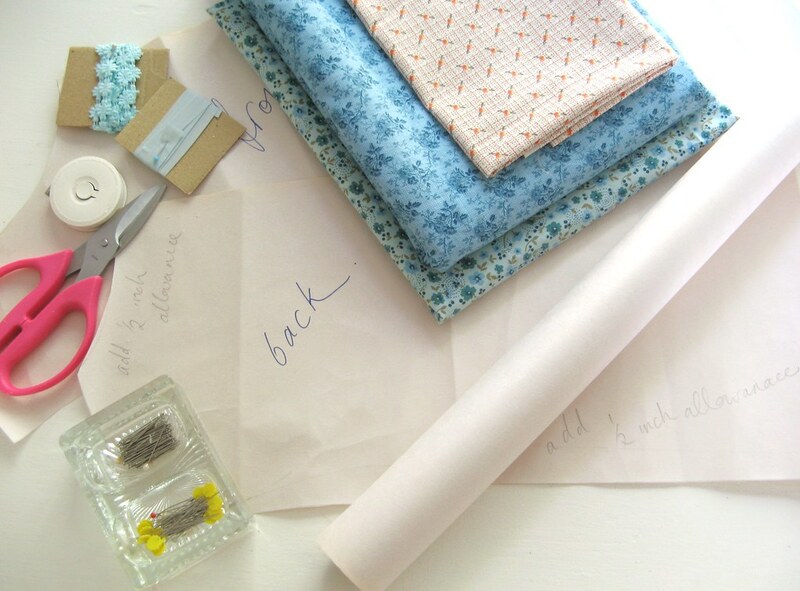 I love it Tiff, will you please do a tutorial or share the pattern if you can? I think your new dress is perfectly lovely and very pretty! And I know it is very well constructed too. Everything you do is so sickeningly perfect! Well my dearest, you have done it again. That looks lovely. Well done, you should quite rightly be very proud of yourself. What an absolutely lovely dress! Well done!! And I love your shoes too! I think I need a pair, in yellow too! Who makes them? Where can I get them? I love love love that dress, Did i mention I love it!!!! !WOW thats a ME dress. oh! it's just lovely. LOVELY! Can you make me one? Congratulations~You did it!!! Can't wait to see you create next. I think it is so cute. Love how it came out. 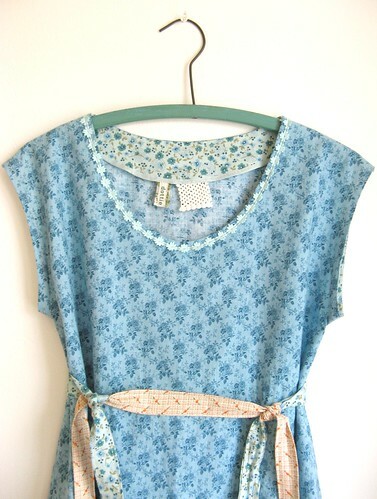 Hi - the dress is soo gorgeous - Hope you're thinking of doing some for your etsy shop. I like the way you used the lace. By the way I have the same lace. I love it! Can I just add that those yellow shoes are awesome, that's my exact favourite shade of yellow! Your dress is great and it looks absolutely wonderful with your skinny jeans!!! I am not surprised your are proud of yourself it's wonderful. The fabric is really pretty and I love your attention to detail. It is lovely! How clever you are. It's lovely. Not at all potato sackish. Congrats to you and to Ms. Ethel on a job nicely done. That is a fabulous creation! You should be proud, I love the attention to the little details. It's what makes a clothing a piece of treasure. Well done on the dress, Miss Tif. Very pretty, indeed! It's sew cute! Totally makes me want to sew for myself more! its simply gorgeous, tif, really!!! will the pattern be available? pretty please? I meant that in the nicest way possible! this is such a pretty dress! you did a great job and i didn't think potato sack once when i looked at the pictures. 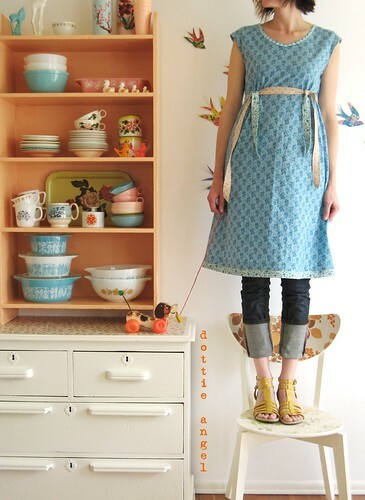 i love the dottie angel details and all of that blue (especially with yellow sandals). WOW. What more can I say. It's a dress of complete WOW. Its perfection. I adore it with the turned up jeans. Its seems Olive likes it so much she has turned to wood? so dottie angel-icious. nice work lady :) i really need to learn how to sew. Oh I love it! It looks amazing and fits really well. Well done you. Well done, it looks great! Comfort is most important as well as being the colour blue! 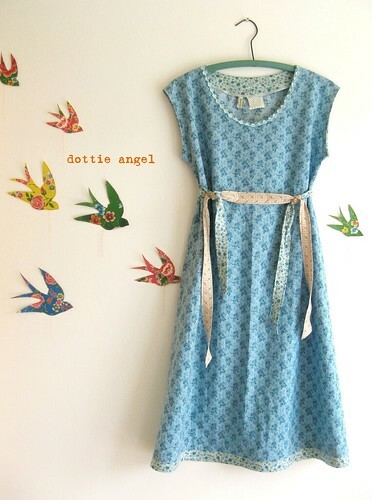 I must say: I love your Dottie Angel charm, and the dress is absolutely wearable! I get so ispired, surfing around in your blogpages! Thanks! OMG Tif, it is SO cute! Good job! You should make more and sell them on Etsy!! Looks brilliant. Good move going for sans button-holes! 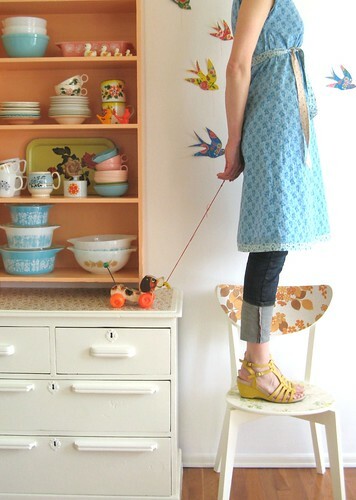 I looovee all these "standing on stool" pictures, and this retro allure around! fantastic again. Ooooh I love it! The colour is gorgeous! I'm in love with your shoes as well... I'm thinking a similar pair may need to be added to my collection! Oh Tif it's adorable! You really have worked your magic! I love the fabric, the pretty detail around the neck(Guipure flowers I believe)I love the belt made with 2 fabrics too!A fabulous dress indeed! They'll be no stopping you now! lovely dress, is there no end to your talents!! i love youre yellow sandals too, makes me feel the need for some groovy new footwear to hit the streets in now the sun is here!! oh tif, it's absolutely wonderful, well done! Congratulations, it's beautiful. You are so clever and creative, Tif. It's lovely, Tif, very impressive and beautifully finished off. Fancy making it "out of your head" as my mother used to say. sooo super cute!! clever girl! High hopes truly fulfilled: lovely dress, well done! Good luck at the storage unit, sounds like fun!! It's so beautiful! Congratulations on your lovely dress. you are awesome!! your style kills me with inspiration- and courage to do it "dottie" style. the shoes are a great "cherry on top" of the whole ensemble. i can only hope that with a bit of practice, i too could someday be the fashionista that you are! congratulation! it must be great to create something that was entirely imagined! I wish I could do the same thing one day! not .... your dress does not look like a potato bag, she is sublime! It's really gorgeous that dress. Oh! :) It's a lovely dress!! Well done - and the fabric you chose is just so cute and spring-y. :) Eeek! Wonderful frock. Looks so wearable. Oh me! Oh my! positively vaporish in my admiration! Well done!! lovely! i especially like the belt/tie detail. and it does look beautifully made. i do believe i may be out doing 'little olive' in the number of comments received today... and that is most flattering indeedy! Beautiful Tif, and in my favorite colour too! Looks great on, with your skinny leg jeans...cant believe you have four kids and look so good! The dress looks perfect to me! Great choise of fabrics! I'm experimenting with my new sewing machine and everytime I finish a project I can't believe I really did it! And I can't stop staring at it. Ha! Of course..I wouldn't expect anything but perfection from you...it's wonderful! I have said it before and I will say it again - Tif you are so very clever!! It looks gorgeous and I think you should sell them in your store. I would buy one in every colour. it is amazingly cute, good job ! Have a great day, and enjoy your dress ..
P.s. 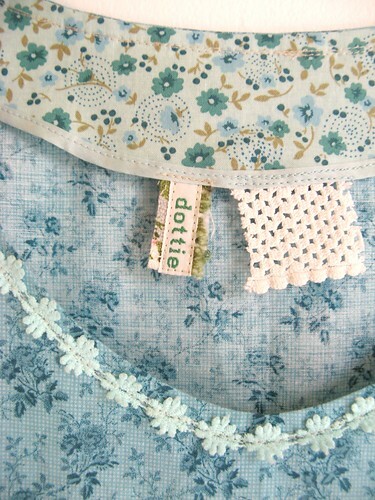 I love the 'Dottie' tag and the little lace one. Sooo fabulous! I'm terribly impressed. It is a truly charming dress. Well done! i have now been blushing for nearly 24 hours... you are so kind indeed. the 'little snoopy' fisher price doggie was spotted at freemont fleamarket on sunday by our #1, he still has his little wooden shoe and original string. she knows what i like does she not! i asked the lady what she wanted for him, thinking it would be too much for when i see them usually they are over $25. she said "a fiver". i said "okay" and felt rather happy indeedy! the sandals were from Target several seasons ago, most comfortable considering they have a heel and yes it was the yellow that made me gasp! and shell out the $16 they were asking... places like Target must be avoided on the challenge year or else i would see such things as these sweeties begging to be bought! i'm so delighted by your reaction to my 'high hopes' frock, truly you have been most generous! I think your dress is wonderful, and you are rightfully proud of yourself for putting it together from beginning to end. I think it is an all-together fine thing to do a good job and to feel fulfilled and happy about it. Good work! Your blog, writings, and design since is so refreshing, interesting, and creative! I would like to join your Challenge Of The Utmost Kind, effective today...:) Thanks so much! See, what high hopes can accomplish! The dress is lovely on you. Sometimes we just have to dive in and trust our instincts. Good for you, Tiff! it is so cute. to be honest i was a little doubtful about it from the first couple of pics. but man, it rocks on! it is so pretty and springy! wish i had the time to whip one up right now. I love it! I especially love tie detail, it's the little details like that that I adore so about anything you create. Well done! You should be happy with yourself! Oh Tif you did it!!! I think you have done a amazing job...it looks wearable...it looks comfortable...and I want one!!! Great work...Love the colour and the little ties are just sweet!!! hi tif.. look what i found! did you know that already? btw... LOVE your "floral potatoe sack" .... would wear ist immediately myself! What a gorgeous frock and the shoes are fab! Really, this is just delicious, and I so get the joy of making something to wear. Don't you just feel wonderful wearing it? I love the "label" you put in the inside collar, and the different patterned facing with the neat edging. Perfect, wonderful, and you dressed it with rolled up jeans, which is totally my new favorite way to dress. Girly sweet, but practical! thank you again my lovelies! I am sure that this is comment 103 telling you how wonderful your dress is.....it looks fab - but then you usually do! Love it with the skinny jeans and the yellow sandals! your things are so lovely! gorgeous!!! there's nothing potato sacky about it. well done!! oh kat! you are so funny! Love it, it would be perfect for work as I'm an Art teacher! I am seriously impressed! It is far from a potato sack and is indeed incredibly well made, with lots of attention to detail. Most importantly of all it looks great on you. I also love the birds on your wall! Better late than never. Absolutely fantastic dress - I love it! It looks so nice on you and like you say it fits beautifully. Well done you!